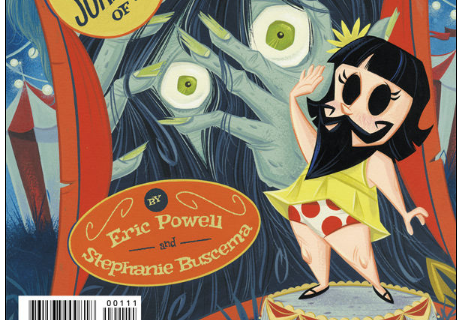 Chimichanga: Sorrow of the World's Worst Face #1 Review – AiPT! Lula is cheerful and full of energy. She wakes up with a bolt and sings her morning song to all in her path. And why wouldn’t she sing–it’s waffle day! Lula is just a regular little girl. Okay, so she has a full beard and her eyes are solid black…she is still just a kid with a big heart. She is such a sweet character that you can’t help but adore her as she marches along in her polka dot underwear. Lula lives in her grandfather’s circus. Wrinkle’s Traveling Circus appears to be the home for more than one unusual character and those are just the people. Her dearest friend is Chimi, an enormous green beast with an incredible appetite. We soon discover that Chimi not only has an unusual appetite but also a very different digestion system as Lula attempts to give him a thorough cleaning. I was immediately struck by the art. Kudos Stephanie Buscema! This is a successful departure from the normal pen and ink we commonly see in comics. The entire comic is styled with a muted color palette which suits the circus setting perfectly. Buscema also effectively uses color to enhance the mood of a panel, like using the occasional bright pink and red background to convey a specific emotion. The images have an airbrush and chalk like quality to them that successfully play up starlight, torchlight and definition in hair and beards. There is this sense of aging throughout in the tent walls and the circus sign that is reminiscent of old circus posters. Each character’s expression is captured beautifully, old or young, animal or human you know exactly what they are thinking in the moment. Eric Powell has written a clever story about a young girl and her beasty friend. The dialogue is relatively simple, well except for quoting JFK and Apollo Creed (you will see what I mean), but it doesn’t need to be overly verbose. There are a few random insightful moments that remind you this comic isn’t just for kids. Overall the narrative flows well as a story told from the perspective of a little girl. A big plus is the imagery plays a major role as a silent actor. Did I like It? YES! Chimichanga: Sorrow of the World’s Worst Face #1 is light-hearted and magical story that reminds us of how for better or worse, we are all human. Readers will be swept up easily in the whimsy and delight in Lula and Chimi’s adventures. My Fears? None at the moment. Let’s see where this vivacious little girl takes us in the next issue.